It's been a good year for Hibiscus here among the leaves. 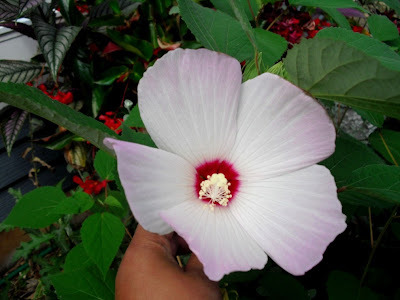 I don't usually have serious problems with my Hibiscus rosa-sinensis plants. Oh, there was that attack of aphids a couple of years ago. And there was some serious leaf loss due to underwatering last winter. But with diligent use of insecticidal soap, and a good pruning, all turned out well. They bloom sporadically during their cool months indoors, and more regularly during their summer outdoors. Hibiscus rosa-sinensis 'Carolina Breeze' enjoying summer on my front stoop. Hibiscus moschuetos, cultivar unknown. The photograph doesn't fully capture the tinge of pink at the edges of the petals. I'm thrilled that for once, I get to fully enjoy both types of Hibiscus in my garden. 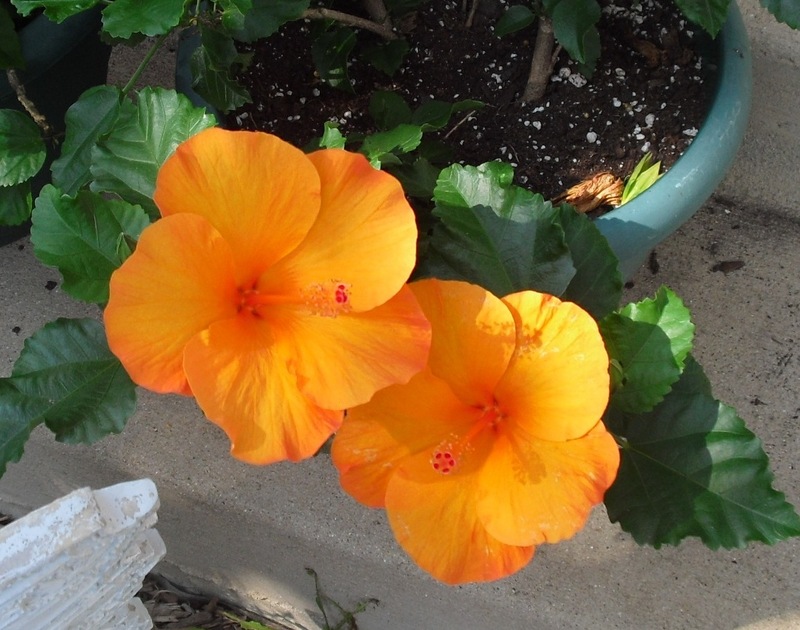 That orange Hibiscus is wonderful - I'd say "I want!! ", but I don't actually want any more spider mite food around here.